Lotte Reiniger’s beautiful 1926 silhouette animation brings to life magical tales from the Arabian Nights. Three years in the making, Lotte Reiniger’s beautiful 1926 silhouette animation, The Adventures of Prince Achmed, brings to life magical tales from the Arabian Nights. The earliest surviving animated feature film – preserved in the BFI National Archive – it has been hailed as one of the world’s most innovative and influential animations. 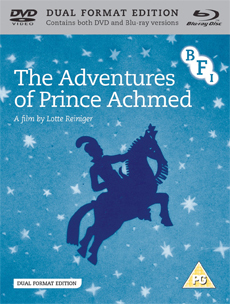 On 19 August 2013, the BFI releases The Adventures of Prince Achmed on Blu-ray for the first time, in a Dual Format Edition with a newly recorded narration and the original orchestral score, along with a selection of Lotte Reiniger’s short films. Handsome young Prince Achmed is brave and eager for adventure, so when the most powerful sorcerer in the world challenges him to fly a magic horse, Achmed plunges headlong into a series of exciting escapades that take him from Baghdad to China via the enchanted spirit lands of Wak-Wak. Made in card, cut entirely by hand, and then manipulated using sheets of lead joined by wires, Reiniger’s exquisite shadow characters move intricately through colourful worlds of demons, witches, beautiful princesses and flying castles. The incredible talent and creativity shown here has influenced the animation in other films including Snow White, Harry Potter and the Deathly Hallows and The Sword in the Stone. The Adventures of Dr. Dolittle (Lotte Reiniger, 1928, 33 mins): a series of three short films based on the classic stories by Hugh Lofting. The Flying Coffer (Lotte Reiniger, 1921, 9 mins): a poor young fisherman tries to rescue the Emperor of China's daughter. The Secret of the Marquise (Lotte Reiniger, 1922, 2 mins): an early advert for Nivea skincare products. The Star of Bethlehem (Vivian Milroy, 1956.18 mins): the nativity story with music performed by the Glyndebourne Festival Chorus. The Lost Son (Lotte Reiniger, 1974, 14 mins): the New Testament parable animated in Lotte Reiniger's inimitable style. Fully illustrated booklet with newly commissioned essays by Jez Stewart and Philip Kemp, and a contribution by Marina Warner. Original orchestral score by Wolfgang Zeller.